Soak in the unique atmosphere of the Amazons on Panther Queen Slot at Moon Games! Powered by Pragmatic Play, it is made up of 5 to 6 reels and 25 paylines. It is packed with rewarding features like the Win Multiplier Reel. Get the chance to visit the dense green Amazon forests with the animated backdrop. Also, catch a glimpse of a beautiful waterfall in the distance. An immersive gaming experience awaits you on Panther Queen Slot! The reels are enclosed within a green frame filled with symbols like the Panther, Monkey, Puffin, Snake, Red Flower, A, K, Q, J and 10. Meet the Panther Queen for lots of adventures in the lush green forest! Launch Panther Queen Slot at Moon Games using a mobile or desktop device. Start the journey by placing your bet on Panther Queen Slot. Pick one of the amounts found on the Coin Value display by toggling the + and – signs. After setting all your preferences, press the Spin button to get started. You can also make use of the Auto Play option to enjoy a set number of games which are automatically launched. Bet Levels: The 25 lines are all active during your gameplay. Amount of Paylines Selection: Find different coin values, such as 0.01, 0.03, 0.05, 0.10, 0.20 and 0.50. Coin Values: The bet values vary from £0.40 to £20.00. 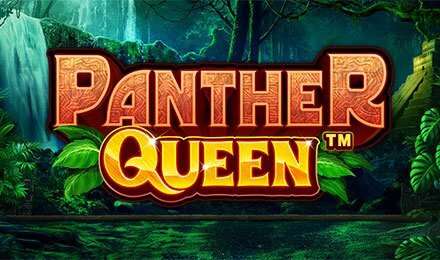 The Panther Queen is the Wild card on Panther Queen Slot which helps to complete winning combinations by replacing any other symbols. When it appears in the middle row, it expands to cover the reel, creating a possibility for a massive payout. The 6th reel on the right-hand side of the screen consists of different win multipliers such as 1x, 2x, 4x, 8x or 10x. This reel spins together with the others and the value on which it lands is applied to the wins. Enjoy a Free Spins round on Panther Queen Slot when the Temple symbol appears in the frame on the Multiplier Reel. You are then rewarded with 5 free spins. During the round, the reels 2, 3 and 4 land on a giant 3×3 symbol. You can also earn 5 extra free spins each time you land the Temple symbol during the feature. You can thus retrigger an unlimited number of free spins! Enjoy the beautifully designed Panther Queen Slot at Moon Games and have a wonderful time. Wish you good luck!